Poverty and lifestyle choices pose the biggest barriers to being involved in sport, new figures have suggested. A snapshot of who takes part in sport in Wales - and how often - was published on Tuesday, as part of the National Survey for Wales 2016/17. The survey of more than 10,000 people found 59% had taken part in sports in the previous four weeks, falling to 49% for those in deprived households. Sport Wales said it highlighted the challenges to improve participation. "What we need to focus on now is breaking down the barriers to sport and physical recreation for those people that are not yet benefiting," said Sarah Powell, chief executive for Sport Wales, which is tasked with promoting sport and physical activity in Wales. "Once we start tackling those issues - which I know are the reality for so many people - then we can start to unlock a really healthy future for Wales." The Sport and Active Lifestyles survey is the first time detailed figures on sport participation in Wales has been gathered as part of the National Survey, the Welsh Government's look at the state of the nation's health and wellbeing. Because it uses different ways of assessing activities, the new survey is not comparable with previous Sports Wales studies, and sets a new benchmark for how taking part in physical activity in Wales is measured. It means it can examine issues surrounding lifestyle choices and economic activity - and what affect that might have on being involved in sport. Those who smoke, eat less fruit and vegetables, or are obese are all less likely to participate in sporting activities, found the survey. However, one healthy lifestyle choice does buck the trend - those who drink over the recommended 14 units of alcohol a week are more likely to take part in sport - that risk increasing with the amount of exercise. There are also stark geographical differences in Wales. Blaenau Gwent has the highest percentage of people surveyed who had not participated in sport at 66% - over in neighbouring Monmouthshire it is just 42% - while next door in the county of Newport it is just 39% - the lowest level in Wales. But according to those questioned, six out of 10 people wanted to do more sport and physical recreation. 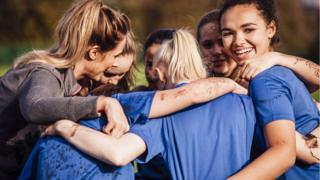 Welcoming the survey, the Welsh Government said Sports Wales was maintaining a focus on increasing the number of people who take part in sport. "Sport Wales already work with a range of partners to extend their reach into groups that have traditionally been under engaged and will continue do so," added a government official.